Travel Guide: A Day Trip to Ang Thong Marine National Park from Ko Samui and Ko Pha Ngan — Blake Erik. The Gulf of Thailand is home to many island archipelagoes, rocky limestone cliffs and rock formations rising from the waters, bays featuring powdery white sand beaches, and crystal clear water perfect for snorkelling or kayaking. Located west of the popular island destinations of Ko Samui and Ko Pha Ngan is Ang Thong National Marine Park, or Mu Ko Ang Thong National Park, which comprises of some 42 islands, mostly uninhabited, as well as caves, lagoons and beaches which make for a popular day trip from the the aforementioned two islands. From my trip to Thailand, I've turned some of my photography into my brand of everyday products which you can check out below. 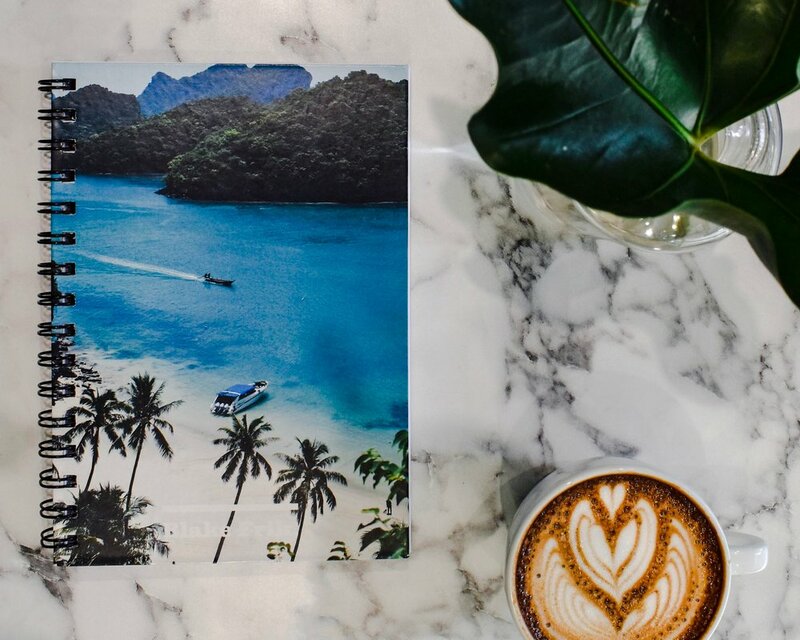 Worldwide shipping is available so if you're looking for a notebook with dot grid, blank or ruled pages to take home to remember your travels if you too have been to these parts of Thailand, or for some travel inspiration! In this guide, first covered will be practical information including how to get there, how to arrange tours, various fees and such, before concluding with what we did and our actual experience on the ground. Because this is such a popular day trip from Ko Samui and Ko Pha Ngan, as well as smaller islands like Ko Tao, many tour operators offer this as a staple in their itineraries. We booked our tour through our resort, where we were presented with three companies, two operating via speedboat, the last via a slower boat. The companies offering speed boats offered about the same price, and we paid ฿1, 900 per person, and paid an additional ฿300 which is a compulsory fee that has to be paid when entering the National Park as a foreigner. For what we booked and paid (with charges posted to our room bill so we didn't pay upfront), it included pick up to and from our hotel by minibus which was clean, timely and efficient. Also included was a light breakfast— think a couple of bananas, juices, coffee and tea rather than anything substantial or appetising, but this wasn't a problem for us as we had breakfast included at our resort. A buffet lunch was also included on the main island of Ko Wua Ta Lap in the Park where the headquarters are, which was sufficient but nothing much to write home about. We also had snorkelling equipment which was limited to goggles accompanied with a breathing apparatus. Flippers weren't provided and are not permitted in the islands because years and years of thousands of tourists descending on these islands with their footwear in the water and standing atop corals has destroyed a lot of the coral reefs. The tour was also covered by insurance, as well as a tour leader (we had two on this trip), and other boat crew to facilitate the activities on the day. Unlike my experience out in Flores Island in Indonesia, where organising sailing day trips was a peach because all tour operators were located on one main street in Labuan Bajo, this wasn't the case for Ko Samui, and I didn't have the time to seek tour operators one by one and check in with them for prices, so I assumed what we paid for would have been an inflated price or one that the hotel would've taken a cut off of. When speaking to various tour leaders and crew over the days, I was told the tour would've cost around ฿1, 800 to ฿1, 900, so savings would've been minimal anyway if I made the effort to seek out tour operators myself. And given how just about every tour company offers the same itinerary, I can imagine prices are all within the same bracket anyway. Mind, I was informed by the crew themselves that prices rise to around ฿2, 500 in high season, which I was told by a member of our resort staff lasted from July to September, as well as November to December. So what we paid for here in June 2018 might not be the price quoted year-round. The company we went with was Lomlahkkhirin, and we saw plenty of other day trippers from other tour operators. We were picked up from our resort at 8am, and we took a short trip picking up other travellers staying at other resorts in the vicinity, and within 20 minutes arrived at Lomprayah Samui Maenam (Pralan Pier). From there we had to check in at the counter, and fill in personal particulars for insurance purposes, before collecting our wristband and proceeded to wait at the pier (or enjoy the light breakfast) while they waited for the rest of the group to show up. When they did, we were called over to the pier's edge at about 9am, where we were introduced to our tour leaders for the day, coupled with a short briefing on the day's activities, and the boat left the pier to head to Ko Pha Ngan, a 30 minute ride away to pick up the remaining passengers on the boat. They fill all seats on the boat where they can, and both days I toured with Lomlahkkhirin, the boats were full, even looking across other boats anchored where we were, there's no shortage of people joining these tours though we never had trouble getting seats for 5 or 6 people on a boat trip the next day, which were instructions from our resort staff anyway. Around 30 people or more can go on a single boat. We stopped at a sheltered bay at Ko Wao for snorkelling as well as a short cave exploration. However, and I'll have to be comparing a lot of my experience here with my experience in Indonesia a month ago, the snorkelling here was not that fantastic. Part of it was due to the fact that it rained the day before, washing a lot of sediments into the water making it slightly cloudy, and I'll attribute the rest to the fact there are just so many tourists here, compared to the relative isolation in that part of Indonesia. I'm not confident snorkelling anywhere near Bali would've been fantastic either to put things in perspective. There weren't very many fish here, possibly due to the fact there are so many humans around, and the corals weren't teeming with life and colour. What I did see though, was tons of sea urchins, which was slightly terrifying knowing I didn't have much protection, and because some parts were pretty shallow meaning I wasn't all that far from accidentally placing one foot wrong if I wasn't careful, so do be careful. Led by our tour leader, we were brought into a nearby cave where rocks were slippery if not sharp, and I got cuts here, but it was pretty cool seeing sunlight pour through a hole at the top of the cave, creating a natural funnel of light. After an hour here, we were given a choice between hiking or kayaking, and I went with hiking just because I wanted to see the incredible viewpoints of the Park I'd seen so much of in pictures. Here's where I advise someone to put shoes on, because I gravely underestimated the hike and doing it in slippers was possible but less comfortable. The hike up and down takes about an hour at a regular pace and not stopping too long at each of the 5 viewpoints, and below are just some of the views at the viewpoints. I even got to see monkeys on this hike, though it'd be important to note that you shouldn't be feeding the wildlife here. Past viewpoint 4, the cover of the canopy gave way to the open air, meaning I was in the sweltering heat of the sun, and the steps were higher and steeper up here, but you're offered an unobstructed view of the islands in the National Marine Park which are grouped pretty closely. We eventually headed back down and back on the boat to head to the main island for food, where we were sharing the shed with another tour group. From what I saw, there were 2 sheds, so there must have been 4 groups in total. Still, it never felt too crowded. The buffet here was pretty standard, but you're not here for world-class dining so it was sufficient. After lunch, we got to walk around the shore or relax on the beach which was a nice break after the hike earlier. When we got back on the boat, we had one last stop to hit, which was the Emerald Lagoon (Talay Nai). The hike up was up some very steep stairs, but this wasn't that high up, and once we got there we got to the viewpoint looking out over the massive lagoon, which I couldn't even fit all into a single frame. After getting some photos, we headed down to get closer to the lagoon, but mind you can't jump in or be in the lagoon itself to protect the natural state it is in, so getting closer to the lagoon just means getting on a gated platform just further down below. After, we headed back on the boat heading back to Ko Pha Ngan and Ko Samui and reached Ko Samui at about 4:30pm, where we were picked up by the same company which directed us to our minibuses by number to take us back to our hotels and resorts. Clearly at this point, given the sheer number of trips they take everyday, everything runs like an incredibly well-oiled machine at this point. There's no deviation from the schedule here, unless you opt for a private charter, which may or may not be more expensive depending on the number of people in your party. With regards to the natural environment, it truly is a stunning slice of paradise, with plenty of powdery white sand beaches, and sweeping dramatic landscapes, and for anyone not from this part of the world or used to seeing any of this in the flesh, it can be properly stunning. I didn't think the snorkelling was fantastic, so if you're looking for world-class snorkelling, you might be better off heading elsewhere, probably somewhere less visited. But the trip to Ko Tao and Ko Nangyuan which is another popular day trip might be a good alternative if you're not going to find yourself exploring other less remote areas of the region. There are many complaints about the crowds, but for me personally, coming to somewhere as popular as Ko Samui and the Marine Park and expecting to find your own slice of paradise feels a little like misaligned expectations, especially if you aren't on a boutique private charter. I never found the crowds too much outside of the snorkelling bays, where there really are just too many human beings in one natural spot. But for hiking activities, it was never too crowded, mostly because the hike itself isn't the easiest so not everyone on the boat makes it to the top, or even attempts at all. I do think it's a very worthy day trip to do, as it's the image of Thailand most people come in search for, and is something the main island of Ko Samui can't quite provide. And on a clear sunny day, my god is it stunning.